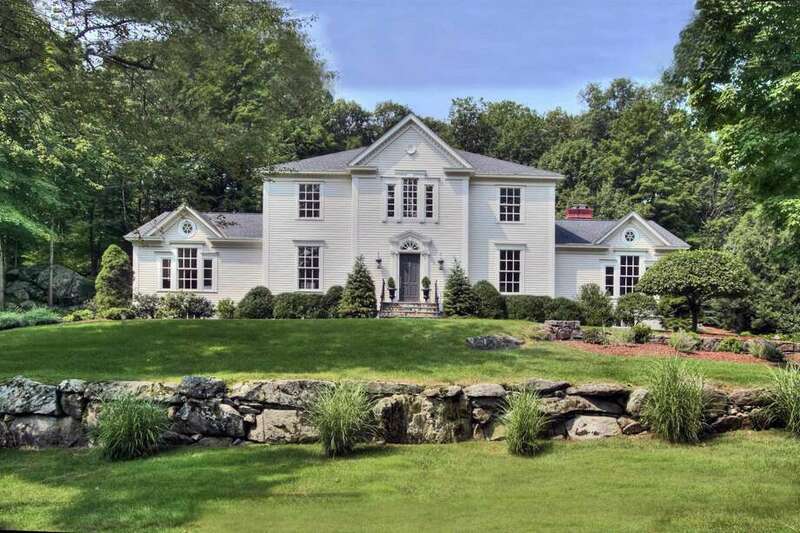 The elegant modern colonial house at 10 Dogwood Lane sits on a one-acre property in the private Tokeneke Association. DARIEN — Elegance is the hallmark of the cream-colored modern colonial house at 10 Dogwood Lane, even as this house and surrounding property invite restfulness in this tranquil setting. The 10-room house sits atop a knoll in the exclusive Tokeneke Association just waiting for its new owners to uncover its sophisticated amenities, not the least of which is the grand man-made waterfall and pool in the backyard of this one-acre property. The waterfall can be turned on and off at will. It is dormant this time of year, but come springtime and summer the meditative sound of water tumbling down the steep rock outcropping and into the pool below can be enjoyed from the Brazilian stone patio or from almost any room inside the house. “This house exudes character and casual elegance,” according to the co-listing agents. And they would know, as one of them, David Hawes, was the builder of this house back in 1989, bringing into existence what an architect from Essex created on paper. So, he and his wife Holly, have, in a sense, come full circle with this special home, which features custom millwork and many other attractive design elements. “He stands by his work,” Holly Hawes said. While the front facade of the 3,652-square-foot house is typical of traditional colonials in this region, the inside has a more modern layout and feel. High ceilings and oversized windows bring the outside in, and this attractive outside view is something its owners will want to invite inside. Likewise, the house is conducive to indoor-outdoor living. A door in the breakfast room opens to the expansive patio allowing for al fresco dining under the pergola and creating an opportunity to sit under the stars. By daylight take in the beautiful landscaping. Beautiful stonework is found on the front lawn and backyard. And there are no unsightly wires or poles to interrupt the view. The utilities are underground. The level of detail on the freshly painted exterior of the house offer a hint as to the level of detail found inside. The framing around the front door includes decorative entablature with a fanlight transom and ionic columns. The door opens into a two-story foyer that provides a view through the breakfast room to the waterfall. Inside, in addition to many creature comforts and visual pleasantries there are other modern, environmentally friendly features including a programmable thermostat, storm windows, and LED lighting. In the formal living room there is a wall of built-in cabinetry with a scalloped arch and glass shelving with display lighting. The formal dining room has chair railing and wainscoting on the lower walls. French doors separate it from the updated gourmet kitchen, which features a center island/breakfast bar for three, quartz counters, a deep tray ceiling, built-in desk area, and high-end appliances. In the family room there is a vaulted ceiling and a stone fireplace with a raised hearth. There are five bedrooms in this house, four on the second floor and the spacious master suite on the first floor. It has a cathedral ceiling, sitting area, a walk-in closet, and an updated luxurious bath with a soaking tub, shower, and marble vanity. In addition to the bedrooms, the second floor features an open office area with built-in bookshelves. On the finished lower level there is a game or play room, media room and ample storage. This house is set in the private Tokeneke neighborhood, where only residents and their invited guests are allowed. Local constables patrol the streets within this association, where not even joggers, walkers or bicyclists are allowed unless at the invitation of a Tokeneke Association resident. Even though the house sits in a very private setting, it is convenient to local amenities. The house is an easy walking distance to the train station, just a half mile away, and shops and restaurants along the Post Road (Route 1). Tokeneke Elementary School is just around the corner. The entrance to Interstate 95 is also nearby. For information or to make an appointment to see the house contact Holly Hawes and David Hawes of the Hawes Team/Halstead Property; Holly at 203-858-5538 or hhawes@halstead.com, and David at 203-856-4775 or dhawes@halstead.com.